It appears as though the white lines that form the squares in this illusion are bent or slightly curved. However, they are actually perfectly straight. You can use the edge of a piece of paper to see what I mean. 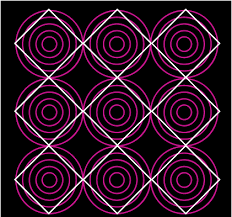 It’s the round lines of the circles in the background that just make the side of the square seem bent. There are actually several great seemingly bent illusions out there, and this is just one of them. You can also check out this other seemingly bent squares illusion and try to figure out if this square is straight or not! And, be sure to check out one of my personal favorites—the crossing circles! Did you like this bent squares illusion? Be sure to rate it with the stars below! They look straight to me. Maybe if the light purple circles were lighter?